Cryo Box PP Moulded in Polypropylene, the top of the box is attached to the bottom through well designed built in hings. The bottom has built- in spaces to hold vials up to 2 ml. capacity. These autoclavable boxes bear alpha numeric index for easy identification of different vials placed inside. 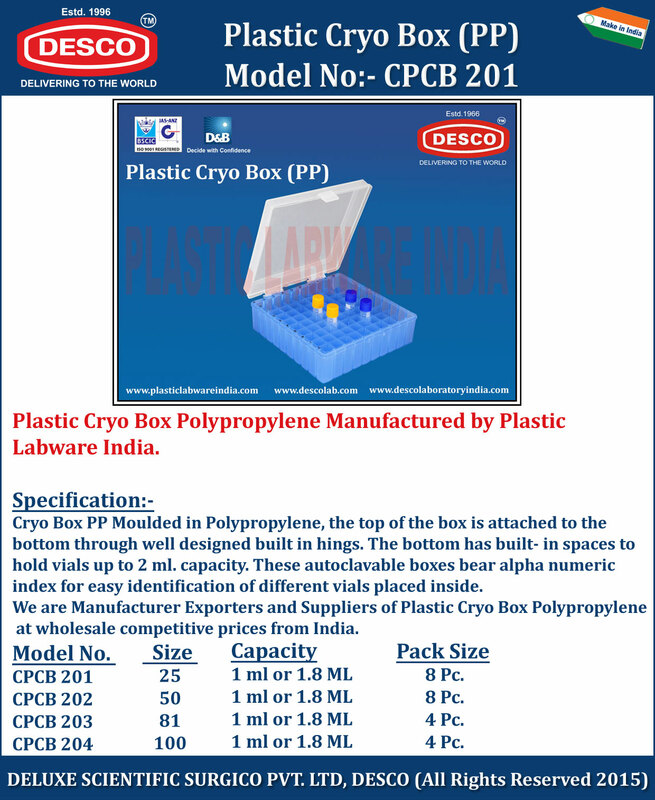 We are Manufacturer Exporters and Suppliers of Plastic Cryo Box Polypropylene at wholesale competitive prices from India. CPCB 201 25 1 ml or 1.8 ML 8 Pc. CPCB 202 50 1 ml or 1.8 ML 8 Pc. CPCB 203 81 1 ml or 1.8 ML 4 Pc. CPCB 204 100 1 ml or 1.8 ML 4 Pc.